I was looking for a hike I hadn’t done before, and one where I wouldn’t get bogged down in any lingering old snow in the evergreen zone—the infamous “monorail” of packed-down snow created by heavy winter hiking traffic. Trip reports said some spots still had that problem even as of May 15. So I came up with a 10-mile loop with about 2700 feet of elevation gain in the Evans Notch area, a place I have taken a great liking to. I knew from the reports that the Baldface Circle loop was free of snow, but—“been there, done that.” My loop was just north of that. I left my car at the Baldface Circle parking lot on Rt. 113 and walked a half mile up the road to the Mt. Meader trail. Up to Mt. 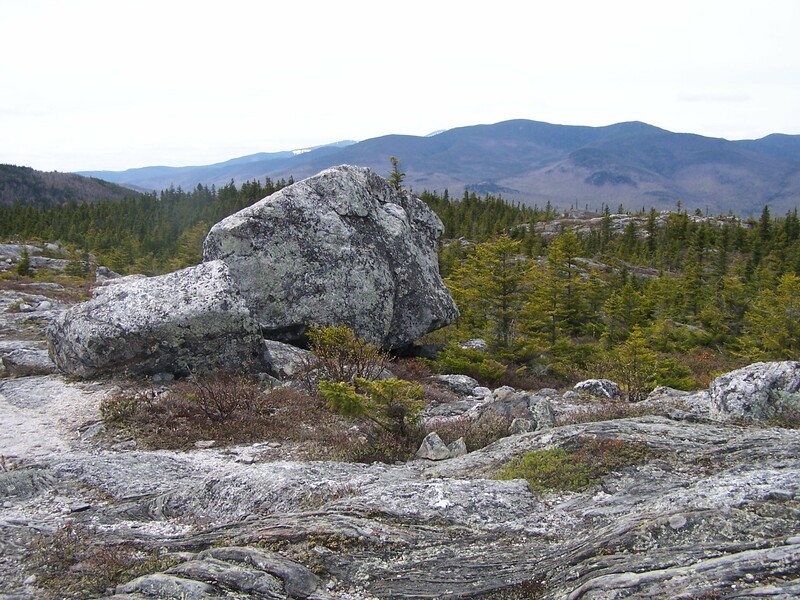 Meader, south on the Meader Ridge trail, and then down on the north part of the Baldface Circle trail. I hadn’t been sure which direction I was going to do my loop, but in the parking lot as I was getting my gear ready, a pair of guys was preparing to set forth as well, and one of them was a talkative fellow who had an extremely loud voice that seemed to be going nonstop. Nice guy, I’m sure, but the thought of hearing that voice at least as far as the trail split helped me decide. I set off up the road, with the guys about 30 seconds behind me, and I figure they must have wondered where the heck I was going as they turned off to go up the loop. 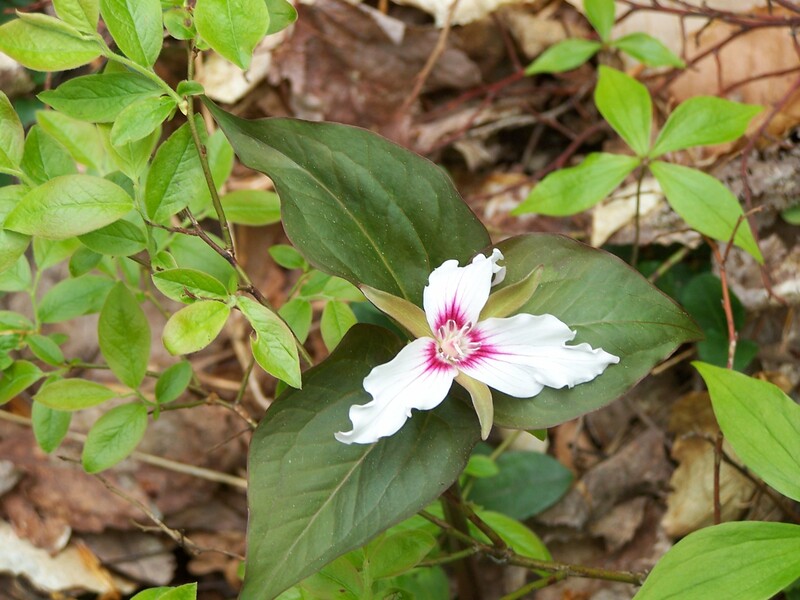 I started seeing flowers right up from the Mt. Meader trailhead. 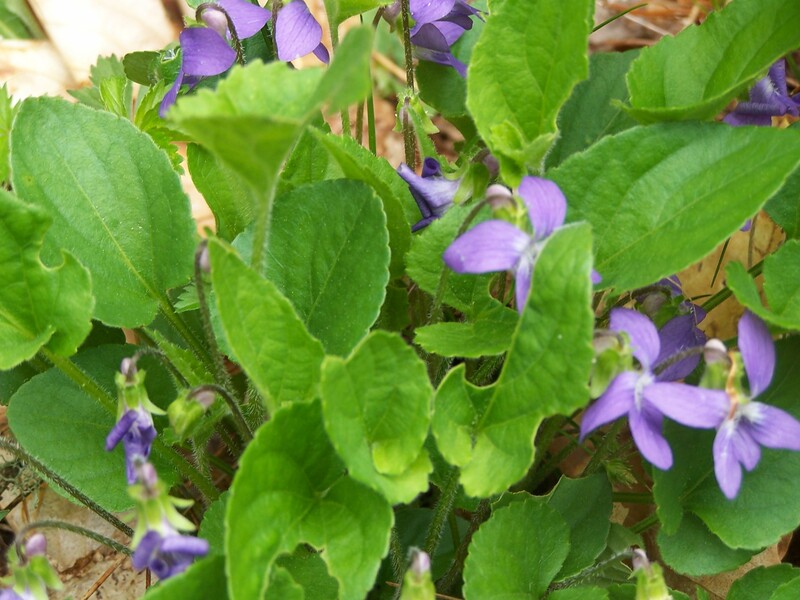 First there were anemones and twinflowers, then violets. 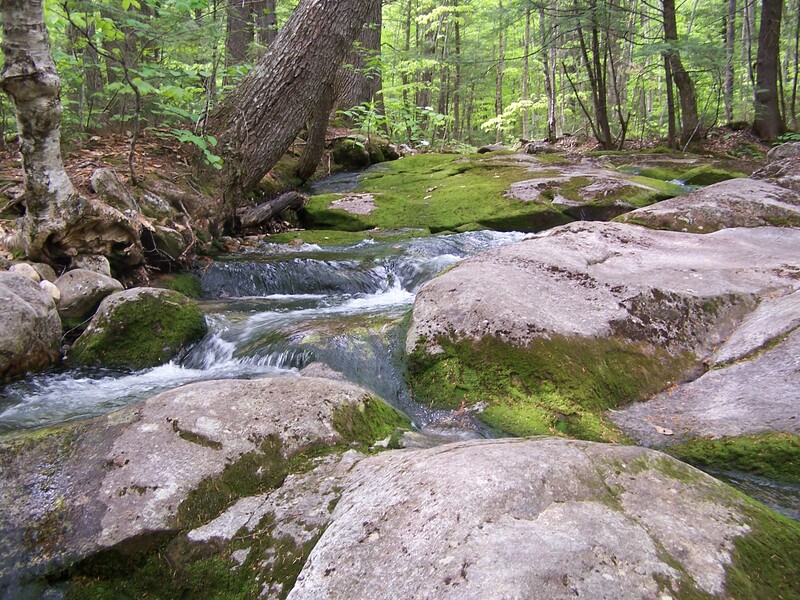 The trail was an old logging road for a while that followed Mill Brook. I enjoyed the sight of ferns starting to unfold. The climb was gradual until about 1600 feet, when the trail started to switchback and then hit a section where it went straight up. 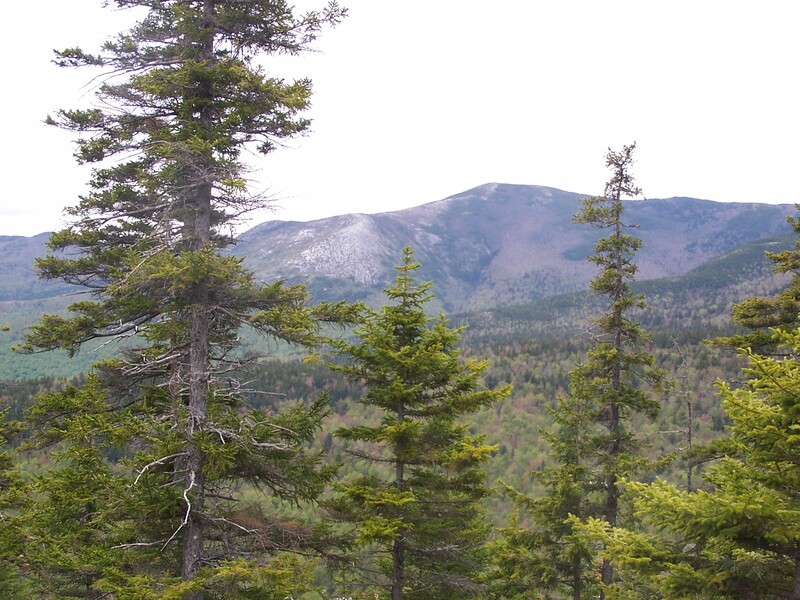 At about 2300 feet I hit an open ledgy area that had views over to the Baldfaces. 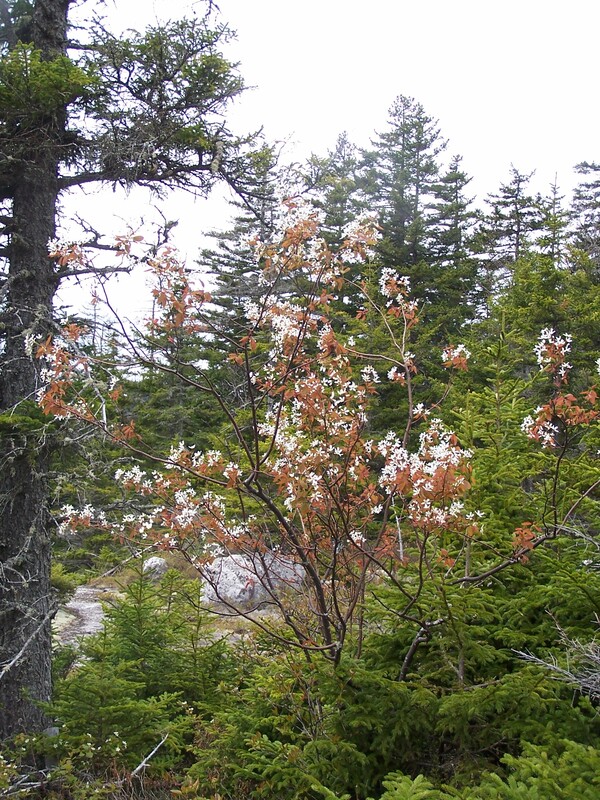 I continued climbing past open ledges with clumps of serviceberry in bloom. Finally I reached the shoulder of Meader with views to the north and east, and then started along the Meader Ridge trail. 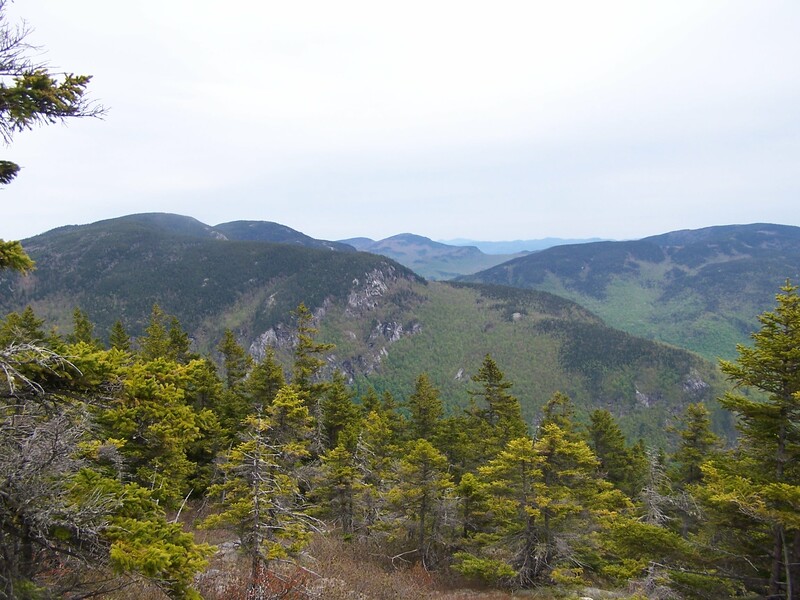 I passed over the true summit of Meader (a mighty 2782 feet in elevation) and came to a side trail marked “View.” Why not, I thought, and went to see the view. However, once I climbed up to the open view ledge, I could see that the spruces had grown up, and the views (toward the west) weren’t that great. 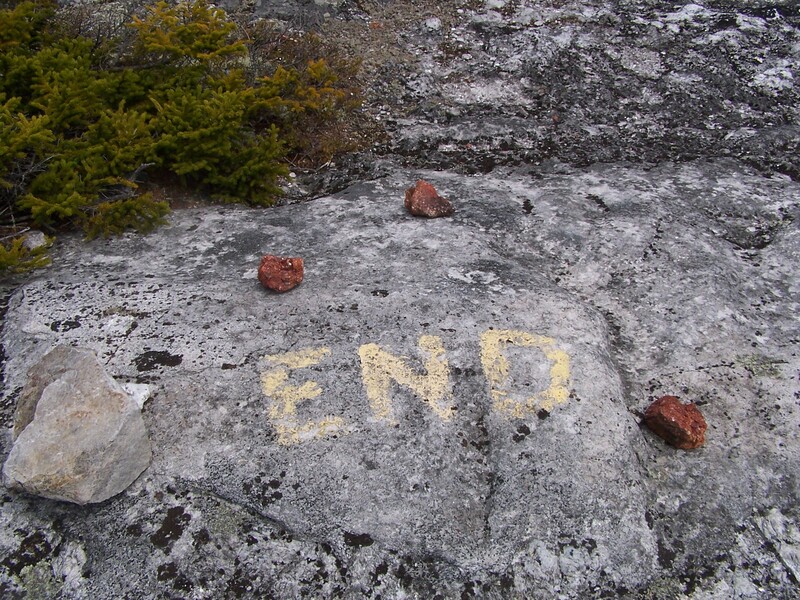 In fact, somebody had painted the word “END” on the ledge so that people wouldn’t continue on and on, hoping to get a better view. I thought that was funny! Meaning, you can stop looking for a better view! It was not long after the “View” that I encountered the only hikers I saw on my loop. I was surprised to see anyone on the Meader Ridge trail, especially on a Monday. They asked me about my route up and down and what the conditions were on the way up. “No snow,” I said, wondering what conditions they were concerned about. They said they were looking for an easier way down. They had come up the “headwall,” they said, and hadn’t liked it. I figured they must be talking about the stretch on South Baldface that involves a slightly difficult scramble. I said, “It’s nothing like South Baldface.” They told me to be very careful, as they’d found the ledges to be steep and slippery. After they went on their way, I found myself slightly distracted: I’d told them I was going down at Eagle Crag. Did they misunderstand and think I was going down from South Baldface? 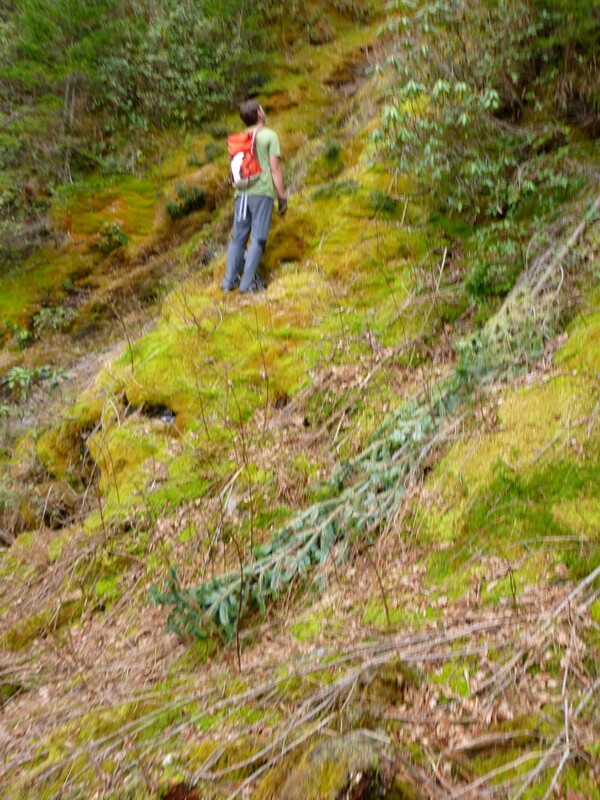 Or had they in fact come up the route I was planning to take down, and found it surprisingly difficult? I scratched my head and continued on. Shortly before I reached Eagle Crag, I saw some interesting boulders and noticed that patches of snow were visible on the side of Boott Spur. I had my Irving convenience store sandwich on Eagle Crag. I like the fact that this spot is a four-way junction with connections into the Wild River valley as well as the valley south of Evans Notch. I then dropped down the Baldface Circle trail, wondering if indeed this was the way the couple I’d met had come up and if I would soon reach a “headwall.” It was a bit awkward going down the first couple 100 feet, but there was nothing that I would call a “headwall.” Soon I was off the steeps and enjoyed wending my way through the forest. 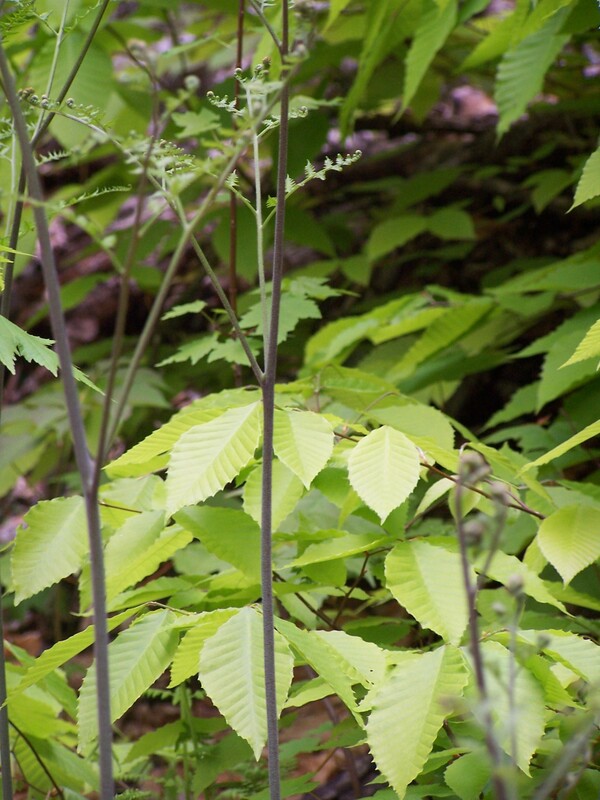 The new leaves unfolding everywhere and the plants poking up from the ground, some still curled up like furled umbrellas, all spoke of spring, spring, spring! Lower down I got back into trilliums as well as clusters of twinflowers, and wound down into the valley of Charles Brook. Toward the bottom I saw a lady-slipper that hadn’t quite opened yet. A very enjoyable hike. I had barely cracked the 3000-foot elevation level (on the top of Eagle Crag, elev. 3030), but after all, my starting elevation was only 500 feet. I look forward to continuing my explorations of the more obscure corners of Evans Notch. 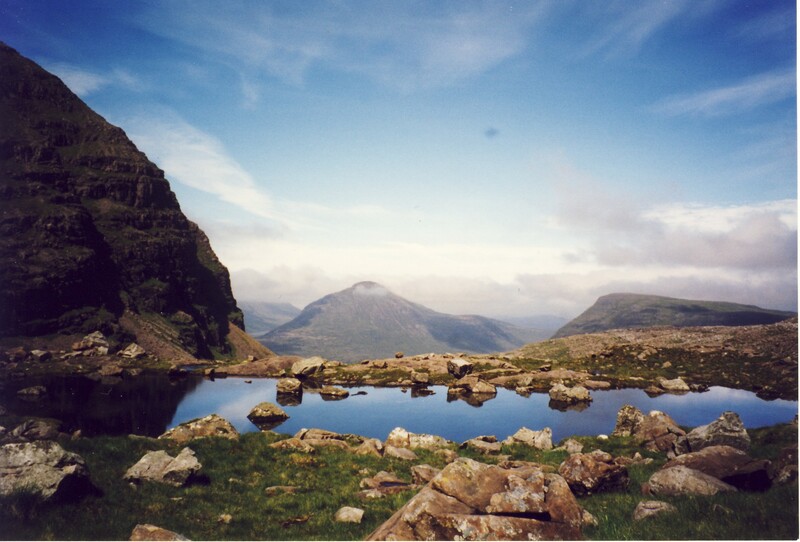 Posted by Jenny in hiking in Scotland, Munros, travel. 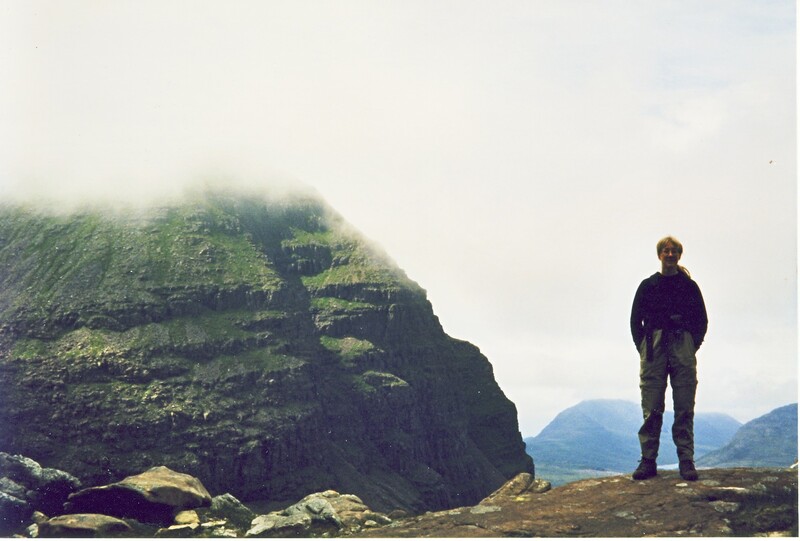 Beinn Eighe was one of the two “Munros” that Bob and I climbed on a trip to Scotland in early summer 1998. It was a beautiful mountain. 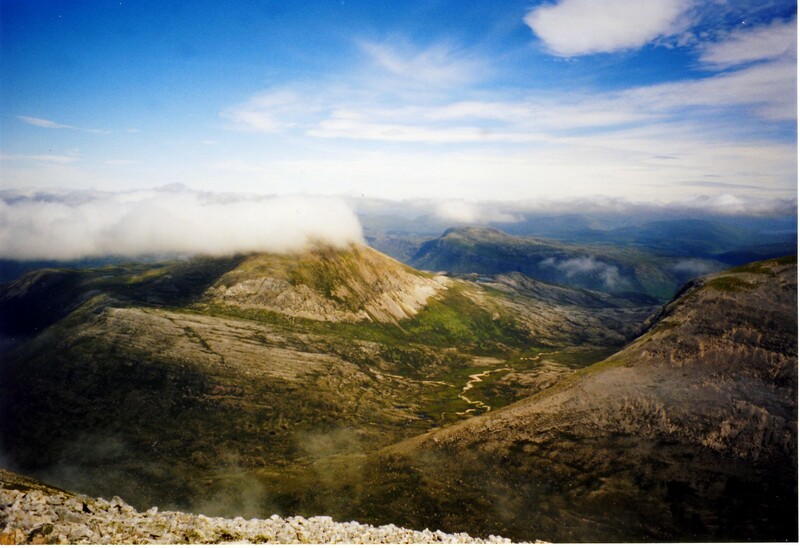 Beinn Eighe is located near Loch Torridon, on the northwest coast of Scotland across from the Isle of Skye. It lies in that part of the map that always sparks my imagination. Any place on the map that suggests vast empty northern spaces does that, for reasons I find hard to explain. It must be that the direction north in and of itself transfixes my imagination, the same way it transfixes the compass needle. I seem to be enthralled, whether we are talking about limitless forests of white spruce in Canada or the treeless horizon of the Scottish highlands. At our latitude of 57 degrees in early July, light completely dominated over darkness. The light didn’t give up ownership of the sky until after 11:00 at night, and then it reclaimed it before 4:00 in the morning. 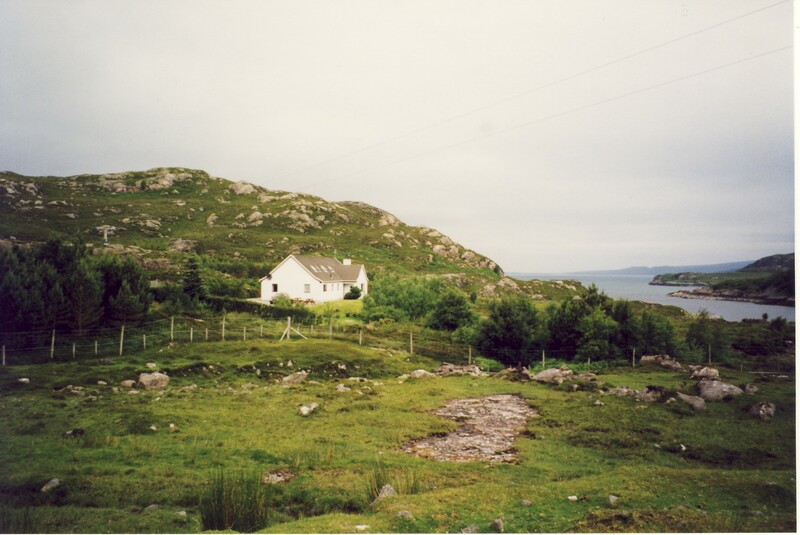 We stayed at a small B & B on a bare, stony hill overlooking the loch. No need to get an early start for our 11-mile , 3000′ vertical outing, so we had a comfortable breakfast before driving up the road through Glen Torridon. We passed the stark mass of Liathach with its razor’s-edge ridge of crumbling sandstone and then started our hike alongside a rushing stream. Fog swaddled the mountaintops, but down in the rough moor where we walked, we were bathed in warm sunlight. 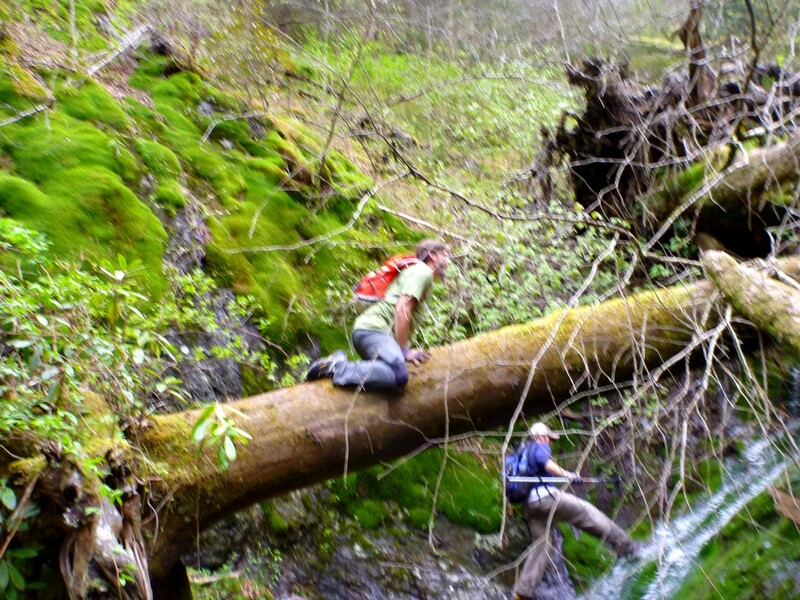 The valley seemed alive with running streams. 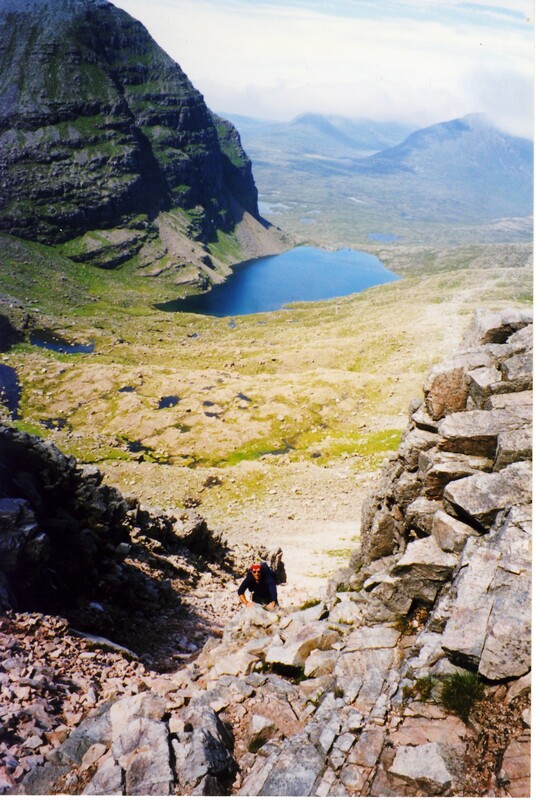 We circled around the western end of the wide Beinn Eighe massif and then curled back southward to climb into a high tucked-away ravine, called in Scotland a corrie. The name of this one is Coire Mhic Fhearchair. At the center of the corrie resided a beautiful loch of cold, clear water, deep green in color when you looked at it up close, shifting magically to luminous blue when you moved further away. Bob tried fishing for a few minutes, but the fish were not cooperating. We continued toward the southeast corner of the corrie, following a rough herd path between pools and waterfalls toward a steep scree slope, then climbed up the scree into a deep couloir. The rocks to the side of the gravel chute made for good scrambling up to the top of a broad ridge. The craggiest of the Torridon peaks stood to our west, but oddly enough I found the rolling open spaces directly to the north to be even more fascinating. It struck me that nowhere in that vastness did I see any roads, houses, telephone poles, or even any fences. I felt the strange pang that comes in the face of the limitless. Another hiker joined us on the summit, telling us he’d spotted two deer and a ptarmigan on the ridge. We rested for a long time before we made our way back through the distinct stages of the journey—ridge, couloir, scree, corrie, loch, moor—that seemed like chapters in an engrossing book.